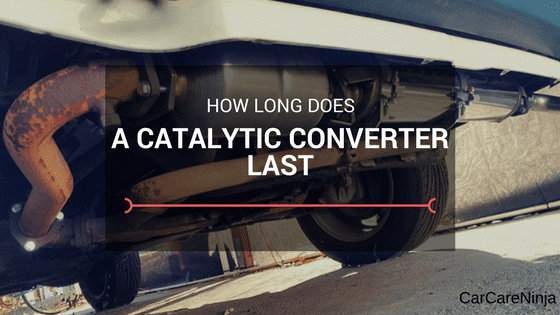 How Long Does a Catalytic Converter Last? Cars age and wear out with time as you get more mileage on them. You may need to replace some of the car parts over a period of time. The same applies to the catalytic converter. This is a metallic canister that is located in the exhaust system. It scrubs the pollutants from your emissions through a redox reduction method.The emission that eventually goes through the exhaust pipe is not harmful to the environment as it contains water vapor and oxygen. Ideally, a catalytic converter is supposed to last the vehicle’s lifetime since it should average about 100,000 miles. Unfortunately, this is not always the case. Some situations will force you to replace the converter, fondly referred to as the cat. ​What Makes ‘Cats’ so Expensive? ​How Do You Know That Your ‘Cat’ Has a Problem? ​Modern vehicles are fitted with three-way catalytic converters which work in three stages. In the first, the nitrogen oxide emissions are reduced by platinum and rhodium. This then gives way to the second stage which involves reducing hydrocarbons by burning them over platinum and palladium which catalyze the reaction. Finally, the third step, which is known as the control process takes over. It sends information to the engine about how much oxygen is in the exhaust to ensure that the hydrocarbons and carbon monoxide is burnt completely. ​The first five directly affect the catalytic converter causing it to malfunction and forcing you to have it replaced. On the other hand, when your cat is stolen it may not affect the functioning of your converter but it definitely messes with your car. This is a common occurrence during harsh economic times as catalytic converters are expensive. They are therefore an easy target, especially those in SUVs and high-stance trucks. ​In order for the catalytic converter to work, it has to have some rare and precious parts and metals. These are the most important components since they are the ones acting as catalysts. The cat has gold, rhodium, and palladium. These elements catalyze chemical reactions to ensure that emissions from your exhaust pipe are safe. They are extremely expensive. This, therefore, makes cats expensive as well. ​Each of these symptoms points to the fact that your catalytic converter could need replacement. However, these are symptoms ​of other car problems as well. It is therefore important to get an expert opinion. Take your car to a mechanic or to the dealership. Let the professional ascertain that it actually is the cat that needs replacement. Sometimes the catalytic converter might be experiencing blockage as opposed to having the catalyst material worn out. This could be because you do not drive the vehicle long enough for the cat to get hot enough to burn the hydrocarbons. The solution to this is to take relatively longer trips on the highway, such as 15 minutes. It will get rid of the hydrocarbons without forcing you to get a new catalytic converter. ​Raise the vehicle off the ground using a jack. This will give you access to the undercarriage.Support the car by lowering it onto jack stands for safety and balance. ​Loosen the bolts holding together the old cat. To make the process much easier, ensure that you use a lubricant on the bolts. Allow it to set for about five to ten minutes so the bolts can come off easily. ​Some cars have a heat shield. If yours has one, then loosen the bolts attaching it to the catalytic converter. ​Once you have removed the bolts, take off the old cat and align the new one then replace the bolts to hold it in place. Tighten the bolts and replace the heat shield if your car has one. ​Start your car engine. If there are leaks in the exhaust system, it points to the fact that one of your bolts might be loose. Remove the heat shield and apply more torque to your bolts. ​Once you are satisfied that there are no leaks, lower the vehicle back to the ground. ​Test the vehicle on the road to see if the catalytic converter is functioning as it should be. ​This simple process can be done at home. It is especially possible if you only have to bolt the catalytic converter in place. However, some converters need to be welded onto the exhaust system. This will force you to take your car to a professional. ​It will definitely cost a tidy sum to have the catalytic converter replaced by a pro. It is also important to note that buying the right cat from an authorized dealer is important. It helps determine how effective the cat replacement is. ​In modern cars, the catalytic converter is supposed to last through the vehicle’s lifetime without needing replacement. Unfortunately, the catalytic converter could get damaged in a number of different scenarios. You will be forced to replace it and it will cost a lot to do this. However, if rightly done, you will not need to replace the converter again.